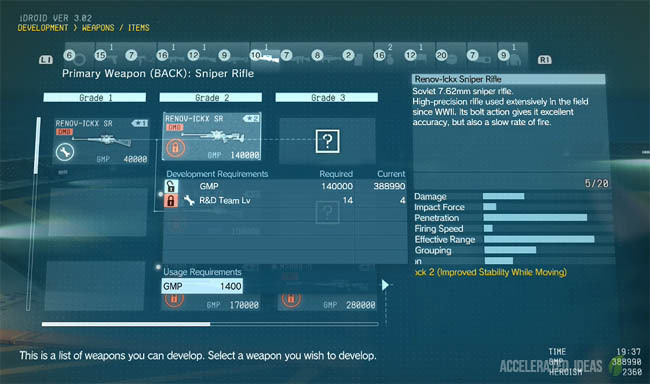 Blueprints are technical schematics which can be found throughout the Phantom Pain maps. They're used to upgrade weapons including increasing damage, range and the stability stats. In this guide I'll show you the location of every Blueprint; in Afghanistan and Africa. Some blueprints are rewards for Dispatch Ops (Combat Missions) but the majority of blueprints are actually hidden in the open world and players need to locate them out in order to claim one for themselves. It's worth remembering that blueprints are rare collectibles in MGSV and as such they can easily be missed in the game. Sometimes you'll need to venture to the far edge of a mission area just to collect them, or scale a particular building to find them hidden deep inside. Whatever the requirement, the rewards for finding a Blueprint are well worth your time. Once you've find a blueprint it's automatically added to your inventory. Besides the schematic, you need the right Mother Base Unit levels, particularly a high R&D level to be able to upgrade the weapon. Then there's the topic of GMP (money) which funds pretty much anything in The Phantom Pain. Make sure you've got amble GMP if you want to start maxing out your weapons and other gear. It can cost hundreds of thousands of GMP even for simple upgrades! I was intending to write a full guide for every blueprint location in MGS 5 but there really is no point because finding Blueprints isn’t that hard if you know what to do. Considering how many weapons are in the game it would also take me til Christmas to finish a list with map locations and I’d rather be providing you with great walkthroughs inside. So...let me explain exactly how to find every blueprint in both Afghanistan and Africa - it really isn’t that hard when you understand the game. 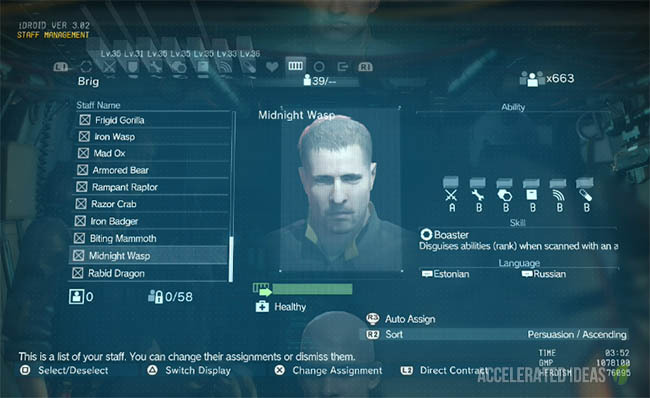 Those two words above are the real key to finding all the blueprints in Metal Gear Solid 5. 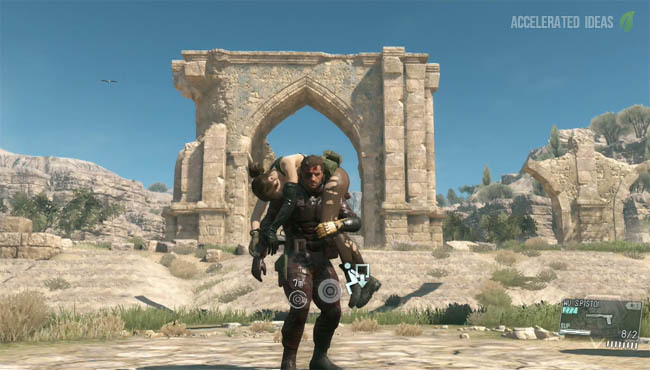 Using stealth isn’t too hard once you get to grips with things; stay low, crouch when necessary and sneak up on enemies. Make sure there are no bodies lying around and make sure no one sees you taking a soldier down. Practicing stealth takedowns is the best way to improve your game and it’ll also help you get higher ranks in each mission. Once you’ve successfully sneaked up on an enemy, press the appropriate button (R2 on PS4) to choke hold the enemy. 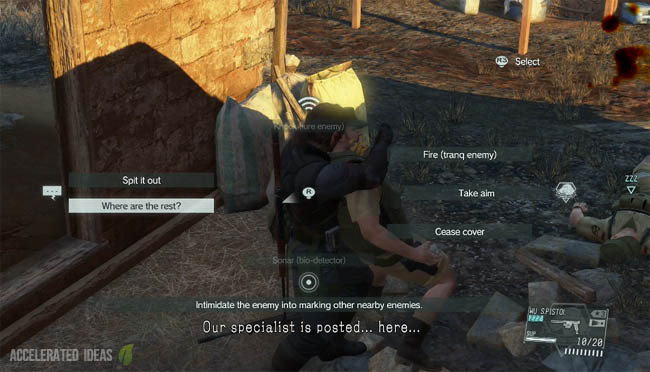 Then press the interrogate button (L1 on PS4) to get the enemy to spill the beans on any information they know about. This can include the location of diamonds, enemies and of course blueprints. The key is to interrogate at least two enemies in a certain location. This will provide you with the exact location of the blueprint. At that point a little tick icon appears on the map and you can hunt down the blueprint and claim it for yourself. The mission objectives screen not only includes the main objectives for every main mission but it also includes any Specialists and Blueprints that are in the area of operations. This way you know when you’re heading into a mission whether a blueprints is available and which weapon or gear the blueprint is for. The only downside to this is that you won’t know which blueprints are included in future missions because they don’t appear on the mission list. So I’ll add a full list of mission numbers (not names, I don’t provide story spoilers) and the blueprints for each of those missions. That way you’ll know which blueprints are coming up on the horizon soon, and thus plan accordingly for your next purchase on the iDroid.. Finally, there is little point in venturing out to collect a high level blueprint early in the game because it’ll just sit in your inventory and you won’t be able to use it. Until you actually earn enough money, level up your Units and in some cases find a Specialist, then the weapon remains unusable. So don’t go crazy over blueprints because they’re not the be all and end all in MGS 5.